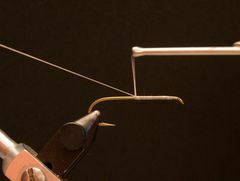 Most of the flies that I tie require a base of thread to be applied to the hook's shank before any materials are added. 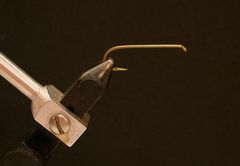 Here is how I attach thread to the hook's shank. 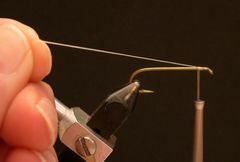 Use this technique with any size tying thread. Clamp the hook in the vice and crimp the barb. I always crimp the barb at the vice not after the fly is attached to my leader. If I do it at the vice I don't have to worry about doing it on the water and I don't risk breaking the hook on a finished fly. Attach the tying thread with a jam knot behind the hook's eye. Be sure to leave a four or five inch piece of thread as a tag end to hold with your free hand as you make the jam knot with your tying hand. Hold the tag end of the tying thread with your free hand at a 45 degree angle to and slightly above the hook's shank as you begin making succeeding thread wraps. As you make successive thread wraps make sure that the tying thread follows the thread held by your free hand down to the thread base. By using this method each wrap of thread is compressed up against the preceeding thread wrap and as you continue making thread wraps the wraps completely cover the hook's shank. After you have made the final wrap of thread clip the tag end and you're ready to begin attaching materials to the hook's shank. 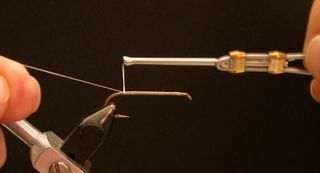 Click on the photo to enlarge it and notice how evenly and completely the thread covers the hook's shank using this simple but very effective technique.